The Portuguese were the first Europeans to reach the Cape, beginning with Bartholomew Diaz in 1488 and Vasco da Gama in 1497. The first Dutchman at the Cape was the naval surgeon Jan van Riebeeck, establishing a base at Cape Town for the Dutch East India Company in 1652. The Dutch settled and grew crops and bartered goods with the Hottentots to obtain livestock from them, and eventually took over their land to form a large Dutch group known as the Boers or Voortrekkers (pioneers) in the late 18th century. Frequent clashes with all of the native tribes of South Africa took place until British troops took over in 1795, establishing a permanent British colony, Cape Colony, in 1806. Construction of a breakwater and harbour at Cape Town began in 1860 to transform the colonial town into a major world port with its grid system of roads and planning. Union-Castle Line was a very prominent and much loved shipping company that operated a fleet of passenger liners and cargo ships on the mail service between England and Cape Town, and other South and East African ports between 1900 and 1977. 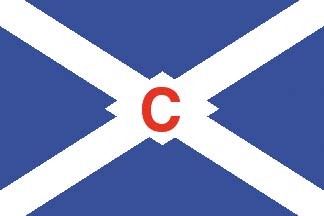 It was established from the merger of Union Line of 1853 and Castle Line of 1862 in 1900, and merged with Clan Line and Bullard, King in 1956 to form the British & Commonwealth Shipping Co. Ltd., and then with South African Marine Corporation (Safmarine) in 1973 to create International Liner Services. It doggedly maintained its separate identity during all of these changes, with the last owned cargo ships sold off in December 1982, and several more ships managed for British & Commonwealth Shipping Co. Ltd. for a few more years after 1982. However, the roots of the company were much more humble, being the projected transport of South Wales coal to Southampton in 1853 for the liners of P. & O., Royal Mail Line, and the General Screw Steamship Company, the latter being the first shipping company to run a regular mail service to the Cape. The Southampton Steam Shipping Company had two directors from P. & O. and one from Royal Mail Line, and its many shareholders subscribing to the £60,000 nominal capital came from as far away as Hamburg. However, before they entered service to Southampton, the first five colliers were taken over for the transport of troops, horses, and equipment for the British and French Governments to the Crimea on the Black Sea in a war with Russia. 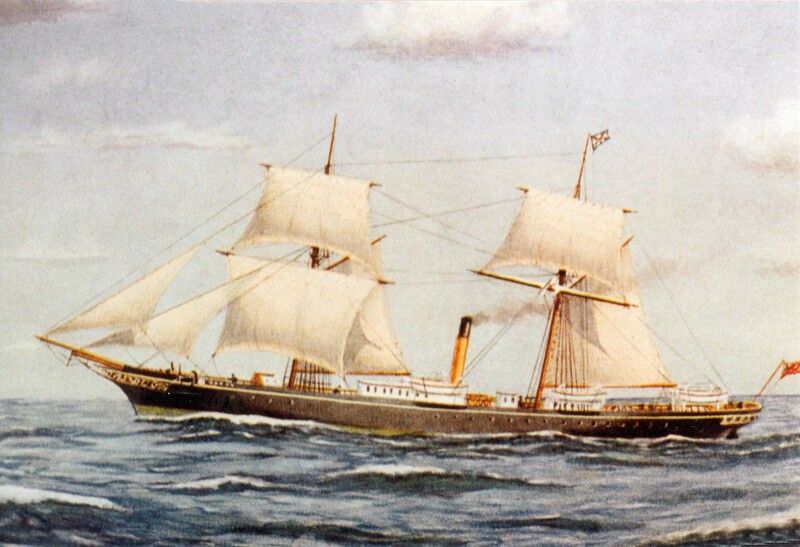 Union of 336 grt was the first collier in the fleet of Union Line, but by December 1856 she and her four near sisters of Briton, Saxon, Norman and Dane had carried not a lump of coal. The company was then re-registered as the Union Steam Shipping Company for a Southampton to Rio de Janeiro service, and on 4th September 1857 the British Government awarded Union Line a mail contract to Cape Colony and Natal. An annual subsidy of £33,000 was paid to the company for the five year contract to guarantee a 37 day cycle. A monthly sailing was to be made in each direction, with a voyage time of not more than 42 days, with ships of not less than 530 tonnes register. The mails themselves were embarked at Devonport for delivery either to Cape Town, Simonstown or Durban. Dane took the first sailing to only Cape Town under Capt. William Strutt, but took a long 44 days under sail and steam to reach her destination on 29th October 1857. She stayed in port for one month, and thus was still there when the second steamer Celt arrived on 27th November with a good passenger, mail and cargo revenue of £325. Larger second hand steamers were then added to the fleet, including Athens of 739 grt in 1858, re-rigged and re-masted at a cost of £450. Passengers at this time had to take their own bedding on the long voyages, and thus the inclusion of a stewardess with cabin bedding provided at the end of 1858 was a big step forward. Speed of the early steamers began to increase to meet the contract passage time of 42 days, with bonuses offered to crews who could beat this time, and with the Cape Legislative Assembly offering a bonus of £250 to the company for each passage below 35 days in June 1859. Cape Colony in 1860 had begun to take on a British character with cultural, economic and political dominance. Incredibly, there were eight newspapers for the small population, of which six were in English and the remaining two in Dutch. 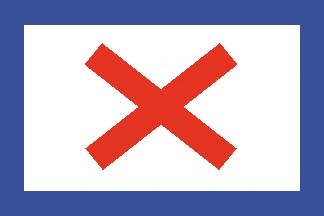 The colonists had already won a measure of self governance, and property owners had the right to vote for a lower house of parliament based in Cape Town. The first steamer to arrive from Europe had been Enterprise in October 1825, with all steamers having to anchor in the roadstead. In the 1840s and 1850s, ships lost in Table Bay reached alarming proportions, so much so that Lloyd’s of London refused insurance for ships bound there. This forced the British Government into beginning the construction of a breakwater and the development of a proper harbour on 17th September 1860. The first safe harbour in Cape Town opened on 17th May 1870 when the Alfred Basin was completed, with the Victoria Basin opened in 1905. These two basins were the main piers of the original Cape Town harbour, and now house the Victoria and Albert Waterfront together with fishing and pleasure boats. The much larger and rectangular Duncan Dock was later opened beneath the peaks above Table Bay of Signal Hill, Lion’s Head and Devil’s Peak that lead up to the imposing flat ‘table’ of Table Rock at over 3,000 feet, which is often covered by a ‘tablecloth’ of cloud spreading along the top of Table Mountain in bad weather. Briton of 1,164 grt was commissioned in 1861, but conditions for passengers were still spartan on the long voyages. The ladies’ toilet and saloon was right aft in the curve of the stern, with the best First Class cabins also aft, and Second Class were berthed ‘midships, and Third Class were in the fo’c’stle. There were no bathrooms, the gentlemen went forward to a cold salt water tub, while the ladies made do with cabin tubs in which they had to stand. Lighting was by means of candles in glass alcoves in the Dining Room and in the cabins, with the crew making absolutely certain that all were extinguished at 2000 hours each night due to the fear of fire. Norman and Dane were transferred to coastal trading in South Africa in early 1863, with Norman inaugurating the Intercolonial service from Cape Town to Algoa Bay and Port Natal in eastern Cape Colony, and adding Buffalo River (East London) in May of that year, but the heavy swell necessitated a stop only in the roadstead with transhipment by lighter. Athens of 739 grt was lost in the Great Gale of 18th May 1865 with Briton, Dane and Athens anchored in the roadstead of Table Bay. However, both anchors of Athens failed and Capt. David Small had no option but to take Athens out to sea. Sadly, as she rounded Mouille Point, a sea swamped her engine room through the open skylight and she was driven ashore with the loss of all 28 souls onboard. In 1870, the Union Line boasted ten small steamers, and two years later Cape Colony was given the status of ‘responsible government’. The first Prime Minister, John Molteno, ordered a renegotiation of his country’s mail services, awarding the South African mail contract jointly to Union Line and Castle Mail Packet Company on 1st July 1873 to avoid monopoly situations with either line. The contract included a condition that the two companies would not amalgamate, as well as other clauses to promote competition e.g. alternating services and speed premiums. This competition led to shipping services with unprecedented speed and efficiency. The contract was, however, to eventually expire, and the period of intense competition between the two lines gave way to co-operation. 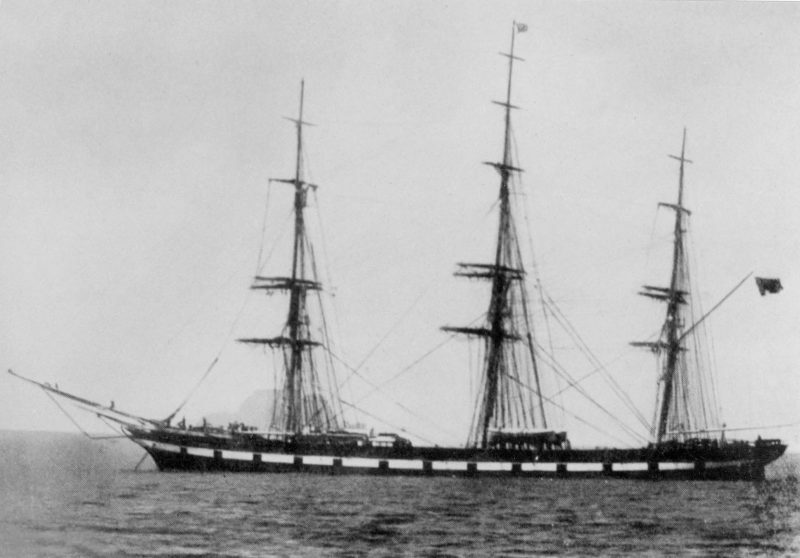 Union Line was heavily criticised in the Cape Town press in 1871 after the arrival of their Saxon in over 37 days from Southampton, while a parallel sailing by a competitor took only 27 days. Fortunately, the twin funnelled Syria of 1,932 grt had just been purchased from P. & O. and retaliated with a fast sailing of 26 days and 18 hours to the Cape. The new joint mail contract of 1873 gave only 26 sailings to Union Line instead of two dozen mail sailings and a dozen ‘extra’ sailings. There was thus a surplus of Union Line steamers, and an ‘Intermediate’ direct sailing from Southampton to Port Elizabeth was begun. When Union Line and Castle Line amalgamated in 1900 with a combined fleet of 42 ships, only 20 of these liners were fast mail steamers, the remainder were ‘Intermediate’ steamers of slower speed and serving the eastern ports of Cape Colony. A newbuilding programme was announced by Union Line in 1877 in response to the competition from Castle Line. The sisters German and Pretoria of 3,028 grt were completed by the Denny yard at Dumbarton in 1877/78 with accommodation for 102 passengers in cabins, and a further four dozen ‘temporary’ Second Class passengers in the holds. They set the design for the next seven steamers in the fleet – Arab, Spartan, Trojan, Athenian, Moor, Mexican and Tartar – and carried enough coal in reserve for both the outward and homeward voyages. Trials speeds of between 13.9 knots and 14.5 knots gave them the ability to keep to the contract speed of 13.5 knots, with German reaching Cape Town on her maiden voyage in only 19 days 8t hours. Tartar was the last to be completed in 1883 and the best of this class, with an overall length of 390 feet, bridge deck of 170 feet and open at the forward end for eighty feet, and accommodation for 160 First Class passengers ‘midships, 160 Second Class, and 100 Third Class. The main First Class Saloon was forward of the boiler casing, and all of her public spaces and cabins were lit by electricity as the first in the fleet so equipped. Trojan had been the first ship to test electric light in her saloon, but no other rooms or cabins were lit by electricity. 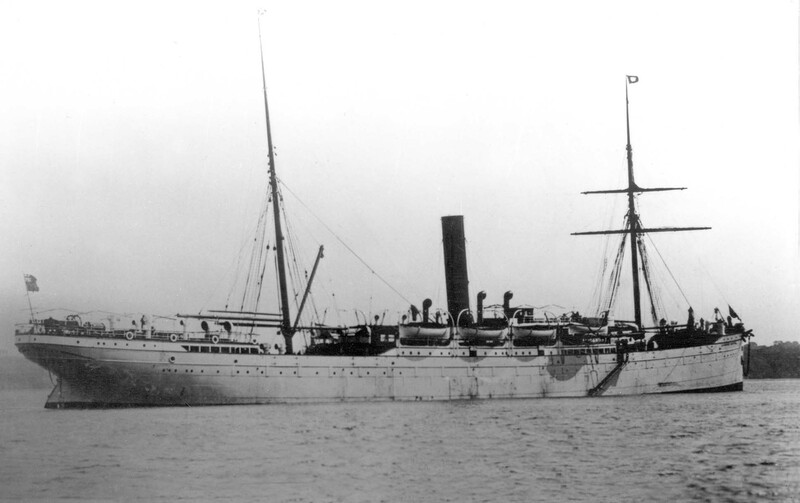 The height of the funnel of Tartar was increased by ten feet in 1889, a short Promenade Deck was fitted aft at the foot of the mizzen mast, and her engines were replaced by triple expansion steam reciprocating engines to become the fastest ship of the Union Line fleet. 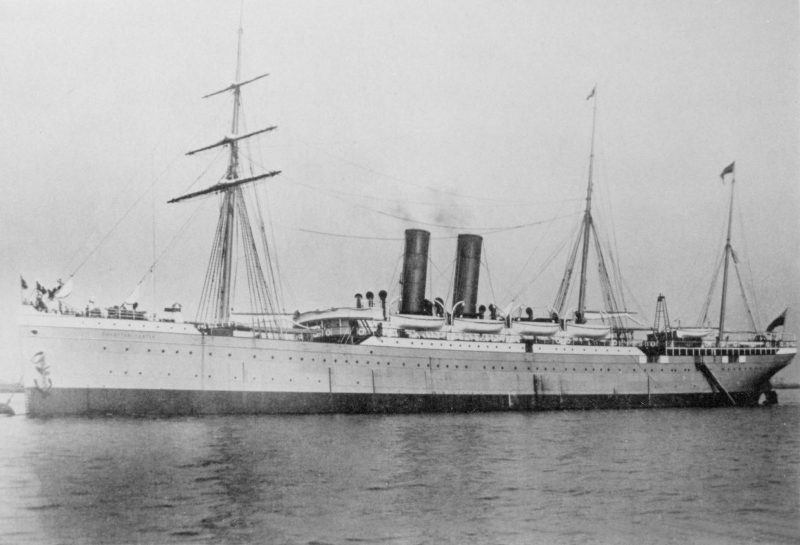 Tartar was sold with Athenian in the last few days of 1897 to Canadian Pacific for their Vancouver services to Skagway, leaving Moor, which had been lengthened and given two funnels in 1894, as the only one of this class of nine to assume Union-Castle Line colours. 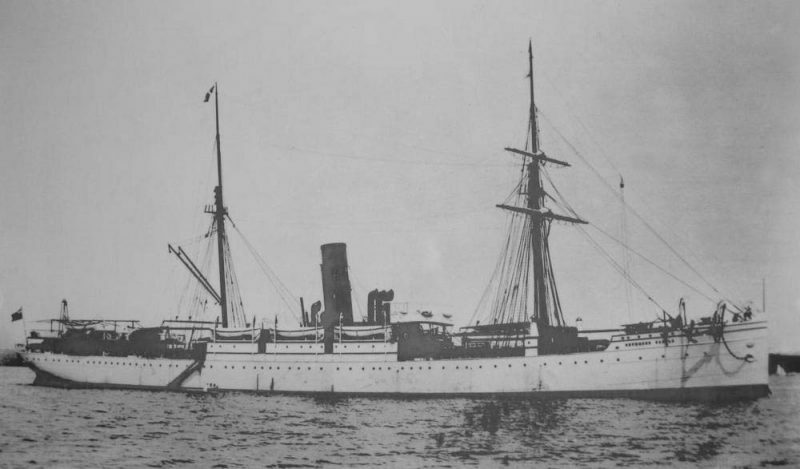 Mexican did transfer to the new fleet in March 1900 but was sunk by collision a month later in dense fog eighty miles north of Cape Town en route to the Boer War, fortunately without loss of life, and Arab, Spartan and Trojan were sold off as surplus to requirements in March 1900. A severe economic depression began in South Africa in 1883, and attempts were made to find alternative employment for Union Line steamers from Liverpool to Newport News and Baltimore outside the South African Shipping Conference of Union Line and Castle Line. Arab of 1879 and the Tyne built Nubian of 1876 took the first sailings, while Natal of 1865 was sold to Trinder, Anderson & Company for the Australian trade. Arab of 1879 was chartered in 1884 to carry the General Gordon relief mission to Suakin, but on reaching Khartoum the British troops found that General Gordon had been murdered. 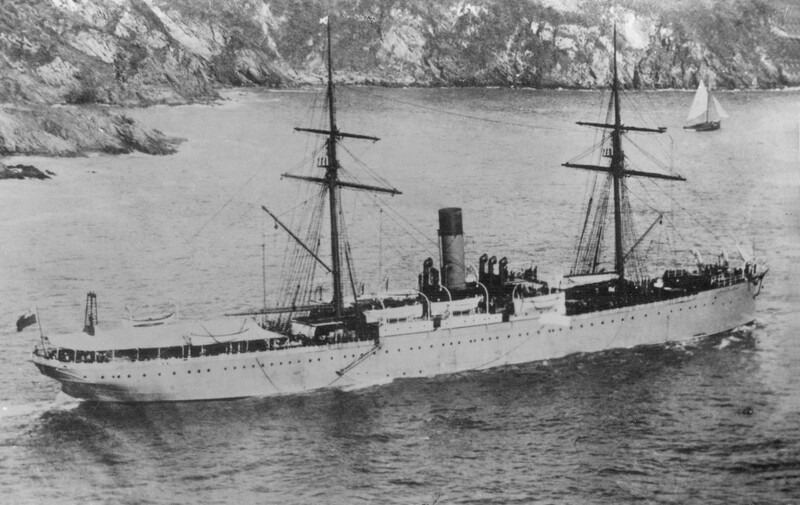 The threat of war with Russia in 1886 led to Moor of 1881 being converted into an Auxiliary Merchant Cruiser at Simonstown, and Mexican of 1883 carried additional troops to Hong Kong. In 1886, diamonds and gold were discovered in South Africa, and homeward cargo then consisted of these precious stones, gold bullion, base metals, foodstuffs, vegetable products, textiles, and other local South African products. The steamers Asiatic of 1872, Moor of 1881 and Pretoria of 1878 represented Union Line at the Golden Jubilee Review of Queen Victoria held at Spithead in 1887. Union Line had a feeder service to Hamburg and Rotterdam, and these small steamers began to pick up Boer settlers at Rotterdam for Durban and the Transvaal. The goldrush in the Rand gathered pace in 1887, with many prospectors sailing for the Cape in Union Line steamers, the voyage times being reduced to twenty days in February 1888 with fast voyage premiums abolished. The liner Australia of 3,664 grt was acquired from P. & O. and renamed Dane in 1889 with accommodation for 255 passengers to cope with the goldrush. A new twin funnelled steamer of 6,844 grt with accommodation for 212 First Class passengers ‘midships, 105 Second Class passengers in the poop, and 108 Third Class passengers on the Main Deck in nine berth rooms was launched on 30th December 1890 by the Denny yard as the innovative liner Scot. She cost £254,000 and was the first twin screw liner to reach the Cape on 10th August 1891 on her maiden voyage to South Africa in a record time of 15 days, 9 hours and 52 minutes. However, her coal consumption at 170 tonnes per day was prodigious and her return voyage was also made in record time. She made her record breaking voyage in traditional Union black hull and black funnel, but her funnels were changed to yellow after her return, and her hull was painted white after lengthening at Belfast in 1896. The mail steamers built before 1891 were also given white hulls and yellow funnels, and subsequent Union Liners built after this date were also given yellow funnels and white hulls, especially the beautiful mail express steamers, Norman of 1894, Briton of 1897 and Saxon of 1900. Norman of 1894 was a near sister of Scot of 1891, but was launched by the Belfast yard of Harland & Wolff Ltd., the builder of some many later Union-Castle Line ships. She had accommodation for 350 passengers (150 First, 100 Second and 100 Third) and was designed to Admiralty troop standards with the appropriate subsidy to meet the extra costs involved. She was given the same powerful twin triple expansion steam engines as Scot, and could also make the Cape in just over fifteen days. A joint Union Line and Castle Line service to New York from Cape Town was inaugurated in 1892. The maiden voyage of Gaul, the lead liner of the ten ‘G’ intermediate class, took place in May 1892, with the class designed by William Pirrie of Harland & Wolff Ltd. at Belfast to put Union Line ahead of their Castle Line competitors in terms of the number and speed of their liners. He visited the ports of Delagoa Bay and Durban to view the rough conditions at the bar of these two ports before designing the class. The ten were Gaul, Goth, Greek, Guelph, Gascon, Gaika, Goorkha, German, Galeka and Galician. Galician was the last of the class and was taken over during fitting out by the new combined Union-Castle Line in March 1900 and renamed Glenart Castle. The ‘G’ class were of around 6,765 grt with accommodation for around two hundred passengers in three classes, with five hundred more being carried in the holds as steerage if required. They were twin screw liners powered by two triple expansion steam reciprocating engines to give service speeds of 12.5 knots. Guelph, Gascon, Gaika and Goorkha were given three masts, the remainder of their ‘G’ class near sisters had two masts. On 13th September 1910, Guelph took the first sailing of a London to the Suez Canal and East African ports service to compete with the Deutsche Ost-Afrika Linie on a ‘Royal East African Service’, and was joined by Goth a month later as the second ship on the route. The twin funnelled Briton of 1897 and Saxon of 1900 were near sisters, with Saxon forty feet longer at 570.0 feet and four feet wider in the beam at 64.0 feet. They had accommodation for around three hundred passengers in First Class, two hundred in Second Class and three hundred in dormitories in Third Class. They were twin screw and had service speeds of 17.5 knots from twin triple expansion steam engines fed with steam by five double boilers and two single boilers. They could speed to the Cape in fifteen days, increasing steam pressure to power the engines to give maximum speeds of 18.25 knots. Saxon was launched at Belfast by Harland & Wolff Ltd. on 21st December 1899 as the final ship for Union Line, and sailed on 16th June 1900 from Southampton on her maiden voyage to the Cape with a white hull, cream masts and the red funnel with a black top of the new Union-Castle Mail Steamship Co. Ltd.
Donald Currie (1825-1909) was one of the greatest personalities of the shipping world in Victorian and Edwardian times, and was the third son of ten children born to James Currie, a barber, and his wife Elizabeth. He began his shipping career as a shipping clerk in the small agency office of his uncle at Greenock at the age of fourteen years. Three years later, he moved to Liverpool to work as a clerk for Cunard Line, which had only three Transatlantic steamers at this time, Caledonia, Arcadia and Britannia, but Currie soon became Head of the cargo department. He was sent to Le Havre and Paris in 1849 in order to take advantage of the abolition of the Navigation Laws to establish branch offices, and shortly afterwards he had a steamer running between Le Havre and American ports via Liverpool. He also established branch offices in Bremen and Antwerp before returning home to Liverpool in 1854. He became a shipowner in his own right in 1862 at the age of 37 years by acquiring a controlling interest in the Leith, Hull and Hamburg Steam Packet Company. The elderly manager of this company died soon afterwards, and his brother James Currie was appointed as the new manager. Incidentally, Leith was close to the Currie family ancestral habitation that was built in the thirteenth century at Midlothian, now part of Lothian. Donald Currie then resigned from Cunard Line in 1862 and set himself up in business at Liverpool with India chosen as the destination of his new ‘Currie’s Calcutta Castles’. Four sister three masted sailing vessels of 1,170 grt entered service that year as Stirling Castle, Warwick Castle, Roslin Castle and Pembroke Castle. This quartet and his subsequent sailing ships sailed on set departure dates to introduce a regularity of service generally lacking in the age of sail. Two steamers, Dover Castle and Walmer Castle, were completed in 1872 to take advantage of the opening of the Suez Canal, but more importantly two steamers, Iceland and Gothland of the Leith, Hull and Hamburg Steam Packet Company, were chartered for a Dartmouth (the port where mails were picked up) to Cape Town service. In October 1872, Walmer Castle became the first Castle Line steamer on the route from Dartmouth and Bordeaux to the Cape. In Cape Town, the Currie ships were always referred to as the ‘Dartmouth boats’ or the ‘London boats’, while the Union Line ships were referred to as the ‘Southampton boats’. The Castle Mail Packet Co. Ltd. was established by Donald Currie in 1876 with his fleet of sailing ships disposed of in 1884. He was then operating in 1884 a fleet of sixteen fast steamers in Dunrobin Castle, Balmoral Castle, Dublin Castle, Taymouth Castle, Duart Castle, Warwick Castle, Conway Castle, Kinfauns Castle, Garth Castle, Drummond Castle, Pembroke Castle, Dunbar Castle, Methven Castle, Hawarden Castle, Norham Castle and Roslin Castle of up to 4,000 grt, with accommodation for two hundred cabin passengers plus steerage class in the holds. They all used auxiliary sails on the long voyages to Cape Town with a spread of canvas of up to ten sails on the foremast and mainmast. There were also several smaller steamers operating between Cape Town and Durban. The triple expansion engine was adopted in 1883 to keep pace with the competing Union Line. Donald Currie became a very wealthy man, mostly from diamonds and gold but also from shipping, as well as by exploiting loopholes in the law, the gullibility of shareholders, and by using the power of a group of companies. He became a Liberal member of parliament, with Prime Minister William Ewart Gladstone (1809-1898) as a friend and sailing companion on the Currie yacht to the Baltic and the south of France. Donald Currie was knighted on 20th July 1881 for services to shipping. Gladstone was a Liberal Party statesman and Prime Minister four times between 1868 and 1894, he frequently stayed at the Royal Hotel in Waterloo near Seaforth when in Liverpool, his birthplace. The hotel had been built in 1816 a year after Napoleon had been defeated at the Battle of Waterloo. The wife of the Prime Minister had launched Hawarden Castle (pronounced Harden) of 4,341 grt in 1882 at the John Elder yard on the Clyde. The ship was the largest vessel yet built for Donald Currie and was named after the estate of William Ewart Gladstone in North Wales. A Castle Line steamer brought news of the British disaster at Isandhlwana on 22nd January 1879 when King Cetawayo of the Zulus defeated a much larger British force. Five days later, Dunrobin Castle sailed from Cape Town at maximum speed for the cable station at St. Vincent in the Cape Verde Islands, where the news was telegraphed to the British Government. Conway Castle was ordered southwards from Dartmouth to pick up any cables in the Cape Verde Islands for delivery to Cape Town. Thus, news of Army reinforcements arrived at Cape Town in a matter of two weeks, and British forces in South Africa were able to plan accordingly with King Cetawayo soon captured. Many unemployed Cornish tin miners sought new work in the deep gold mines around Johannesburg, and emigrated on Castle Line ships sailing from Dartmouth. 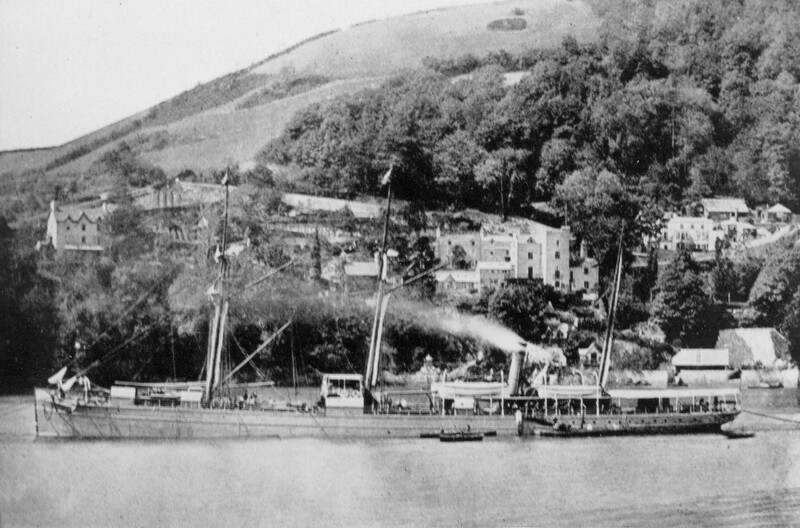 Around four thousand Cornish workers emigrated to South Africa each year in the 1880s, but the trade quickly collapsed and was one of the reasons why Castle Line stopped calling at Dartmouth in June 1891. 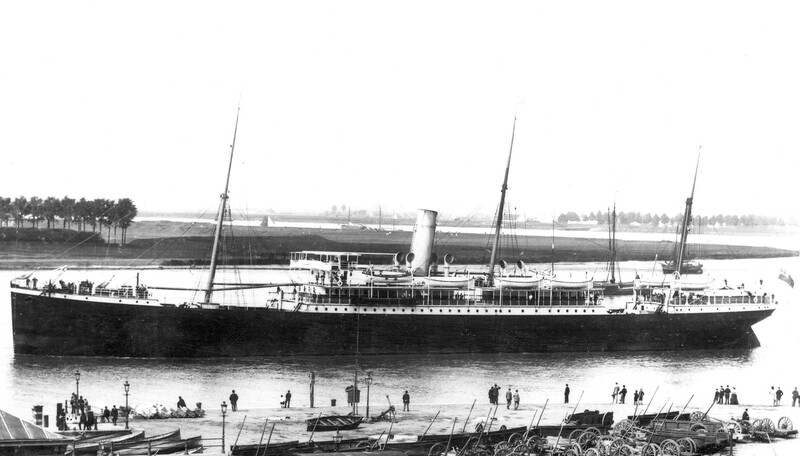 The mails by Castle Line were embarked at Southampton from June 1891, alternating with the Union Line vessels, and the last Castle Line mail sailing from London to South Africa was in June 1900 by Carisbrook Castle, with all mail sailings then transferred to Southampton. The first twin funnelled mail steamer in the Castle Line fleet was Dunottar Castle of 5,625 grt in 1890, with accommodation for 160 First Class passengers in the poop, 90 in Second Class, and 100 in Third Class. Sixteen furnaces on four double ended boilers fed steam to her triple expansion reciprocating engine to give a service speed of seventeen knots. New single funnelled mail steamers were then completed as Tantallon Castle of 1894, Dunvegan Castle of 1896, and Carisbrook Castle of 1898. Tantallon Castle was a much improved version of Dunottar Castle to compete with the famous Scot of Union Line that had come into service in 1891. She had an overall length of 456 feet, beam of 50.5 feet and depth of 23.8 feet. She had two overall decks with an orlop deck outside of the machinery spaces, a long bridge deck, and a short closed poop with a long deckhouse and boat deck forward of it. 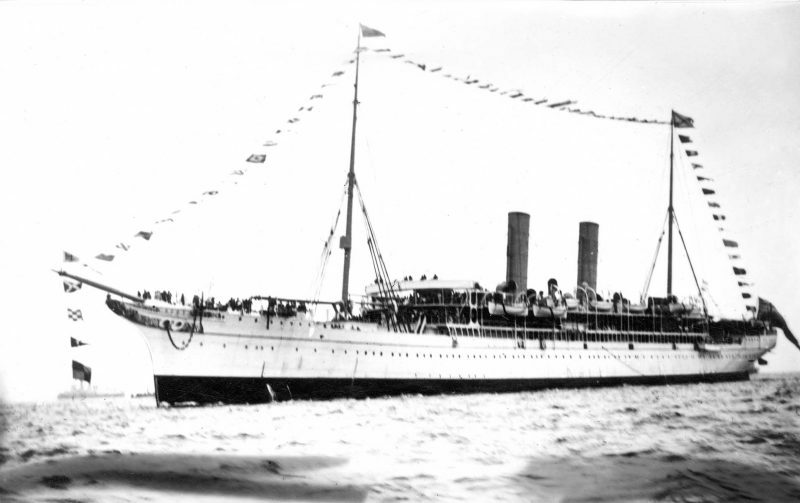 Passenger capacity increased to two hundred First Class passengers, 150 Second Class, and 150 in Third Class, with two special passengers carried on a North Sea cruise in 1895 to attend the opening of the Kiel Canal. These were the former Prime Minister Gladstone and his wife, sailing from London in a large party of distinguished guests, who were entertained at both Hamburg and Copenhagen by local dignitaries before witnessing the opening of the Kiel Canal. Drummond Castle came to grief on 16th June 1896 off Ushant on Pierres Vertes Reef on Molene Island, ripping out her bottom while on a homeward voyage from Cape Town with 143 passengers and 103 crew under the command of Capt. W. W. Pierce. The sea was calm but visibility was poor and Drummond Castle was well off course. Shortly after running aground, Capt. Pierce ordered the boats to be made ready and steam to be let off in case of an explosion. However, the ship had overshot the rocks and sank so swiftly in four minutes that no boats were launched with only three survivors, one passenger and two crewmen. The remaining 243 lives were lost, and divers later found that a long gash had been torn in the bottom of the hull from the keel to the waterline. The elegant twin funnelled pair of Kinfauns Castle and Kildonan Castle of 1899 had accommodation for 250 First Class passengers, 175 Second Class passengers, and 140 in Third Class, and had service speeds of seventeen knots from two quadruple expansion steam reciprocating engines driving twin propellers. Unusually, their number three hold derricks were worked off the foremast and not the derrick posts. Kildonan Castle could be identified from her sister by her totally enclosed poop, and was put into service in October 1899 with incomplete passenger accommodation as a troopship carrying three thousand troops on the outbreak of the Boer War. Castle Line also built several ‘Intermediate’ steamers at this time for service from London and Southampton to Cape Town, Port Elizabeth, East London, Durban and Delagoa Bay, with a possible extension to Mauritius to load sugar. Tintagel Castle, Avondale Castle and Braemar Castle of 1897/98 were joined by two smaller ‘Intermediates’, Raglan Castle and her near sister Dunolly Castle of 1897. Raglan Castle was launched by the daughter of Sir Donald Currie on 20th January 1897 at the Barclay, Curle yard on the Clyde and delivered in August of that year. She was of 4,324 grt and 7,000 dwt with two overall decks, seven main bulkheads, four cargo holds and ‘tween decks, fo’c’stle of length 48 feet, bridge deck of length 117 feet, and poop of length 49 feet. The upper decks were sheathed in teak, a luxury of those bygone days, and she carried 36 First Class passengers on these upper decks, and one hundred steerage passengers in the poop and after ‘tween decks. 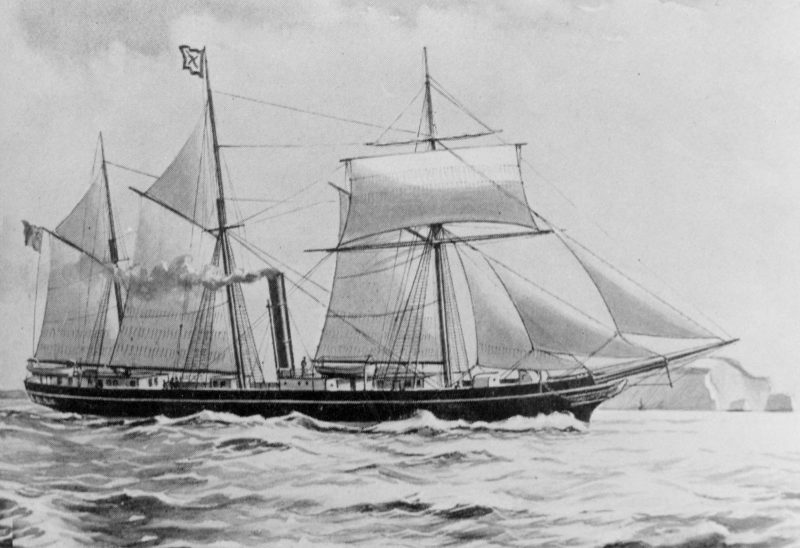 A service speed of fourteen knots was obtained by a triple expansion steam reciprocating engine by her builders, but she and her sister were heavy rollers in a cross sea, and even in a calm sea at anchor in Table Bay, this pair were the only company vessels that could roll in a gentle swell. Dunolly Castle was sold to the East Asiatic Company (EAC) of Denmark in 1905 and renamed Juliette, and Raglan Castle was sold to Russia in the same year for service as a stores ship in the war with Japan. However, before she could sail from the Baltic, the Russian fleet was annihilated at Tsushima and the redundant vessel was also sold to EAC of Denmark for service to the West Indies as St. Domingo. Castle Line played a major role during the thirty months of the Boer War from October 1899 to May 1902. Castle Line carried 172,835 troops and passengers to Cape Town from Southampton. Southampton had replaced Dartmouth as the embarkation point for the mails in June 1891, with Castle Line sailings then alternating with those of Union Line. Large amounts of Army guns, ammunition and stores were also carried during the Boer War. Four Castle Line steamers carried troops during the first week of the conflict, Dunottar Castle, Harlech Castle, Lismore Castle and Roslin Castle, together with their officers and commanding officer Sir Redvers Buller. Kildonan Castle was then completed as a troopship with accommodation for three thousand troops. At a critical point in the war in December 1899, Lord Roberts and Lord Kitchener were ordered to South Africa. 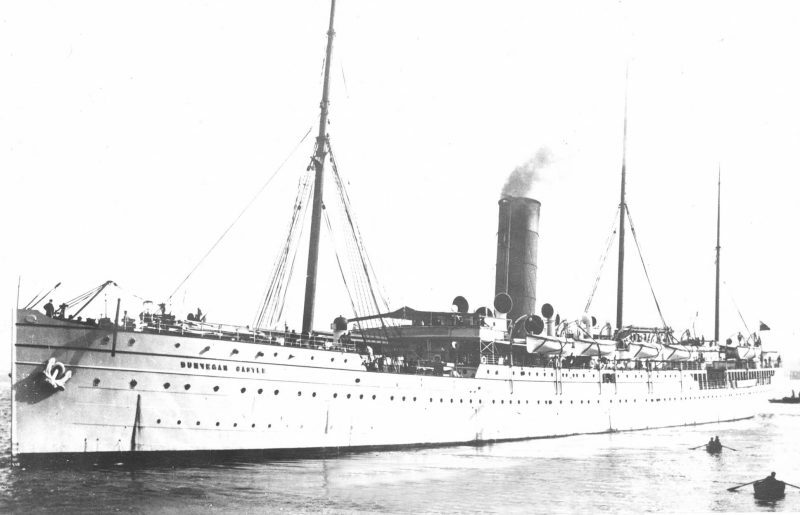 Sir Donald Currie ordered that a Castle Line steamer with Lord Roberts onboard from England should be timed to meet Lord Kitchener at Gibraltar on his arrival from Egypt, so that both Generals would travel together to Cape Town and plan the eventual British victory. After initial Boer successes, the Boer War ended on 31st May 1902 after the British Army had adopted a ‘scorched earth policy’ of burning 30,000 Boer farms, building eight thousand blockhouses, and erecting 3,700 miles of wire fencing guarded by 50,000 British troops to contain the Boers and their guerilla style of warfare. The defeated Boer generals De Wet, Botha and De La Rey passed through Southampton in August 1902 on a mission to the British Government to seek aid for rebuilding Boer farms, but this was refused and they returned home by Union-Castle Line having achieved nothing. The Transvaal and the Orange Free State joined Cape Colony and Natal as British colonies, with all four uniting as the Union of South Africa in 1910. The war had followed a similar pattern to the first Anglo-Boer War of 1881, when initial success by the Boers at Majuba had galvanised Britain to retake land that was regarded as too strategically important to be allowed to pass to the Boers. The Castle Mail Packet Co. Ltd. would take over the fleet (Union 114,000 grt, Castle 107,000 grt). The name would become Union-Castle Mail Steamship Co. Ltd. The managers of Castle Line, Donald Currie & Company would manage the new company. Sir Francis Evans, Chairman and Managing Director of Union Line, plus his Board, would sit on the Board of the new company, called the Council of Management. 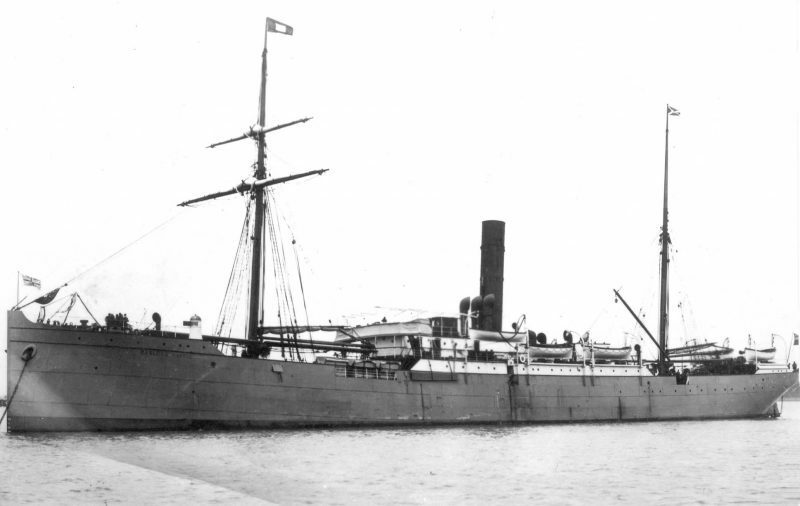 The Union-Castle Mail Steamship Co. Ltd. was to be registered on 8th March 1900.